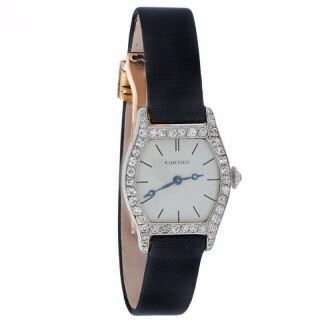 A Platinum Diamond Lady’s wristwatch by Cartier with tonneau-shaped platinum case, with a gold rear and single-cut diamond-set bezel, the crown set with a single rose-cut diamond and the baton-marked dial signed Cartier with metallic blue hour and minute hands, attached via a leather-lined satin strap with a rose-cut diamond-set rectangular buckle concealing a gold déployant clasp. The case stamped with French assay marks for platinum, the clasp with marks for 18K gold. Measuring 16cm in length. Manual movement. 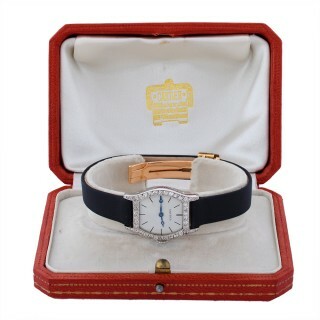 In fitted Cartier box. Circa 1915.